LEWIS AND CLARK VILLAGE, Mo. — After days of rising water levels and flooding along the Missouri River, many neighbors and families are staying with others or in shelters. However, some have chosen to stay behind and take their chances in areas close to dangerous conditions. In Lewis and Clark Village, home to just over 100 people and around six miles from Atchison, Robert Williams can look around and see plenty of empty driveways. Many neighbors decided to head to safer spots as water levels rose around Lewis and Clark Lake over the past few days. Although Williams estimates that the lake has risen around 4 feet this month, the conditions brought little concern to him as water inched closer to his backyard. Williams’ home sits a bit higher than most in the neighborhood. With many residents gone, he told 41 Action News that the area had a much different feel to it. As Williams waits for others to arrive back home, he said he would keep a close watch on the neighborhood. Over in Atchison, some of the residents who evacuated had to make tough decisions. At the Atchison Humane Society, several pets have come into the shelter before their owners headed to safer spots. Lanter said three dogs and two cats had been dropped off at the shelter in response to the flooding. With some people needing to go stay with others or at emergency shelters, Lanter said the Humane Society could help play an important role. Moving forward, Robert Williams hoped conditions would improve as he looked forward to seeing his neighbors return in the coming days. “It’s just one of those things you have to deal with,” he said. 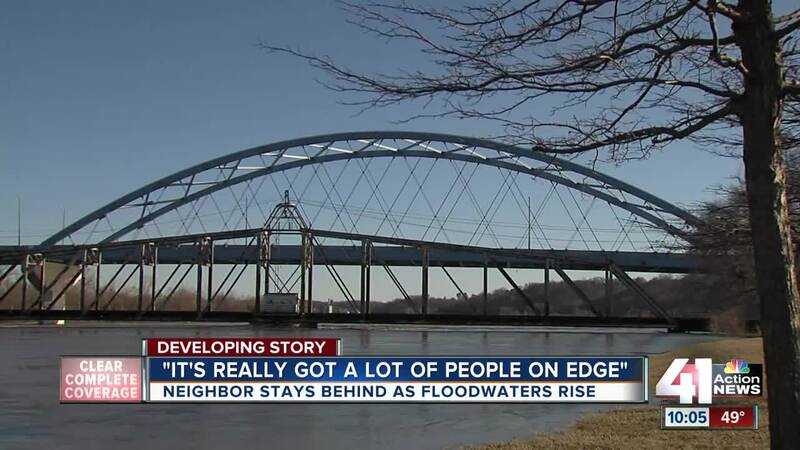 Emergency management officers expect the Missouri River to crest at 31.2 feet on Thursday, 10 feet above flood stage.